The Dutch poet and painter Lucebert (pseudonym for Lubertus Jacobus Swaanswijk) was born in Amsterdam in 1924, the city where he was to live for nearly thirty years. After a bohemian period in his twenties -- when he made several trips to France, especially to Paris -- he finally settled in the North Holland coastal town of Bergen where, until the time of his death in 1994, he lived with his wife and family for more than forty years. In his latter years he divided his time between the house and studio in Bergen and the family holiday home in Spain. 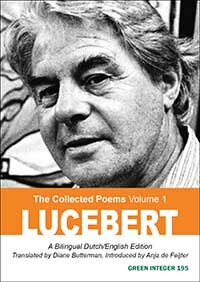 When Lucebert burst onto the literary scene in the early fifties he soon became a sensation, largely because of the experimental and enigmatic quality of his verse. Predictably, such an original poet was instantly embraced by the literary avant-garde of the day as a welcome, fresh and exciting new phenomenon in sleepy post-war Europe, but he was simultaneously eyed with great suspicion and unease by the Dutch establishment whose very foundations he rocked. An energetic and prolific writer and artist, he wrote and published almost 700 poems and generated literally thousands of paintings and drawings in his productive working lifetime which was to span some fifty years. Lucebert’s early impact soon made him an established and acclaimed poet throughout the Dutch-speaking world. The three collections contained in this first volume date from 1951 and 1952 and the accompanying uncollected poems are from the 1949 to 1952 period. High time one might therefore say, some sixty years on, for the poetic works of this vibrant and important voice within the Dutch literary canon to appear in four consecutive volumes in the English language. This first volume contains an authoritative and extremely interesting introduction written by the Dutch academic and Lucebert expert, Anja de Feijter, who is currently professor of Modern Dutch Literature at the Radboud University Nijmegen in the Netherlands. It is the first volume of the complete works of this leading twentieth-century Dutch literary figure to be published in translation by Green Integer.